E-Waste Recycling Tomorrow at Intero Willow Glen! 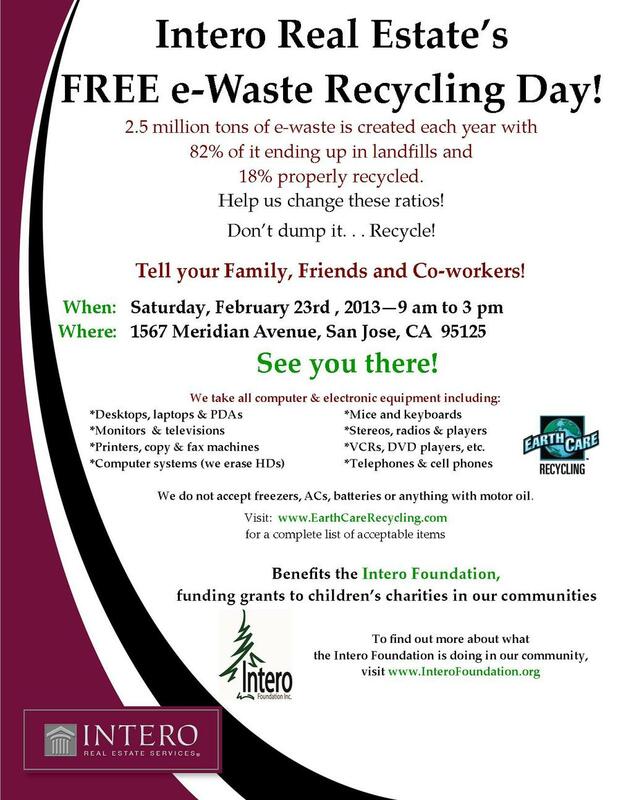 Bring your junk electronics to the Intero Willow-Glen office tomorrow, February 22, to benefit the Intero Foundation! E-waste this Saturday at Intero Saratoga! We do not accept freezers, ACs, batteries or anything with motor oil. Benefits the Intero Foundation, funding grants to children’s charities in our communities!!! Stop by the Intero Meridian office on Saturday, March 17th from 9am-3pm and bring your e-Waste! Bring in your old electronic equipment, cords, chargers, cameras, phones and etc. Make some money to help out the Intero Foundation!! The Saratoga Intero will have an e-waste event on Saturday Nov. 12 from 9am-3pm. The address is 12900 Saratoga Ave, Saratoga CA 95070 on the corner of Saratoga Ave and Cox Ave., near Hwy 85. Bring in your old electronic equipment, cords, chargers, cameras, phones and etc. Make some money to help out the Intero Foundation!! Stop by the Intero Los Altos office on Saturday, October 29, 2011 between 9am-3pm and bring your e-Waste!